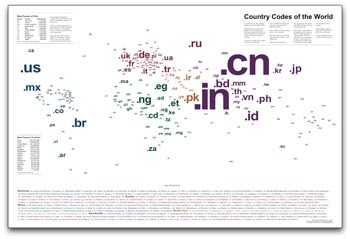 Our latest and greatest map — Country Codes of the World — was published about two weeks ago. Since then, the response has been pretty amazing. I had a feeling that anyone involved in Web globalization would get a kick out of the map, but I have since discovered that everyone from cartographers to lawyers to Web designers have also found the map interesting. I was particularly honored that the popular Web site Strange Maps recently selected the map for their growing collection. I wasn’t sure if our map would be strange enough to make the cut, but apparently it was!